Well done, Pinterest. | there's no place like gnome. I looked at Pinterest this morning to find they suggested this pin for me. 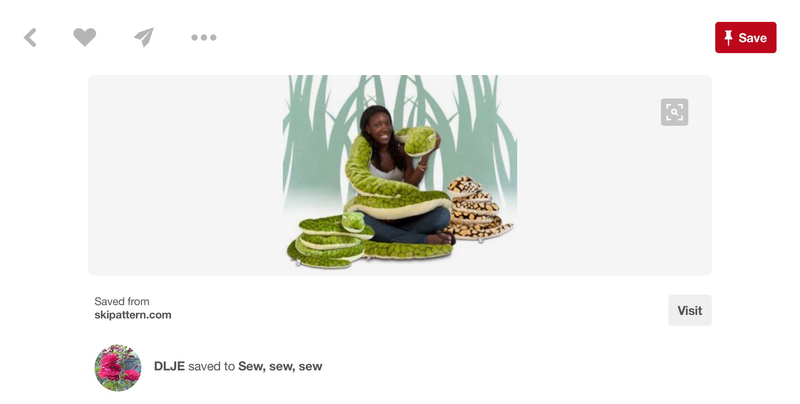 Sew your own snakes. It’s as if Pinterest knew that I walked home from church yesterday to find a snake on my sidewalk. It’s as if Pinterest knew snakes make me scream/jump/shake thirty times more than mice. It’s as if Pinterest knew that snakes are one of my greatest fears ever since I mowed over one a couple summers ago. It’s as if Pinterest wanted to rub it in that I’m now scared to walk in the grass around my house. I walked home yesterday after a kind of long morning. Baptism, communion, ANNUAL MEETING, brunch. As I left church and walked across the parking lot, I called The Boyfriend to solidify later plans. I was on the phone with him when I saw it. The snake. On the sidewalk outside my back door. I screamed. I could barely get out the words to tell him there was a snake ten feet from me. I finally explained what was happening. One guess what he did on the other end while I screamed, shivered, and was bent over in fear: he laughed. He laughed. Are you surprised? I’m not. I said/yelled, THIS IS NOT FUNNY. He continued to laugh. He then suggested I take a shovel to it. (Yeah, right.) Or run over it with the lawn mower. Nope. I walked quickly to the front door and then watched out the window as the snake slithered off into the grass. And then I shivered for the rest of the day. And all day today as I thought about it. Be proud of me, though. I mowed the lawn tonight. And then I walked on the grass to the garden to grab a handful of ripe cherry tomatoes. It’s all about the baby steps as I learn to be outside again. ← Two quilts for twin boys.